^ James, Ralph N. (1897). Painters and Their Works. en:Michigan: en:University of Michigan. pp. 421. ASIN B000Z6GQ0C. http://books.google.com/books?id=LoSQhHjfwpoC&printsec=titlepage&dq=#PPP1,M1. ^ Henri Bremond. La Provence mystique au XVIIe siècle. Paris: Plon-Nourrit, 1908. p. 381. "Sans l'assurance d'avoir un fils, Louis XIII n'aurait pas fait le voeu de 1638." Translation: "Without the assurance of having a son, Louis XIII would not have made the vow of 1638." ^ Claude Dulong. Anne d’Autriche. Paris: Hachette, 1980. 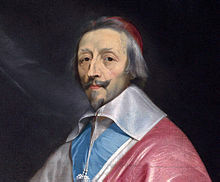 "Irrité de voir tant de courtisans parler de "miracle", Louis XIII aurait répliqué que "ce n'était point là si grand miracle qu'un mari couchât avec sa femme et lui fasse un enfant." 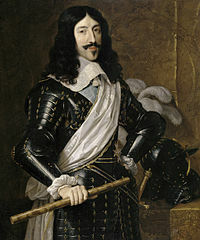 Translation: "Irritated to see so many courtiers speak of a “miracle”, Louis XIII is said to have replied: “it was not such a great miracle that a husband slept with his wife and made her a child.”"
^ "The King gave his first sign of affection for anybody in the person of his coachman, Saint-Amour. After that he showed feelings for Haran, the keeper of his dogs." ^ Louis Cromption, Homosexuality and Civilization, London, 1991. The grandson of Henry III, Saint-Luc, penned the irreverent rhyme: 'Become a bugger, Baradas / if you are not already one / like Maugiron my grandfather / and La Valette'. ^ Louis Cromption, Homosexuality and Civilization, London, 1991. Herbert of Cherbury, Edward, The Life of Edward, Lord Herbert of Cherbury, Written by Himself, Whittaker, Treacher, and Arnot, (London), 1830. Huxley, Aldous. "The Devils of Loudun". The 1952 book tells the story of the trial of Urbain Grandier, priest of the town who was tortured and burned at the stake in 1634. Knecht, Robert, Renaissance France, genealogies, Baumgartner, genealogical tables. Moote, A. Lloyd. Louis XIII, the Just. Berkeley; Los Angeles; London: University of California Press, 1991, (paperback), ISBN 0-520-07546-3). Willis, Daniel A. (comp). The Descendants of Louis XIII. Clearfield, 1999.